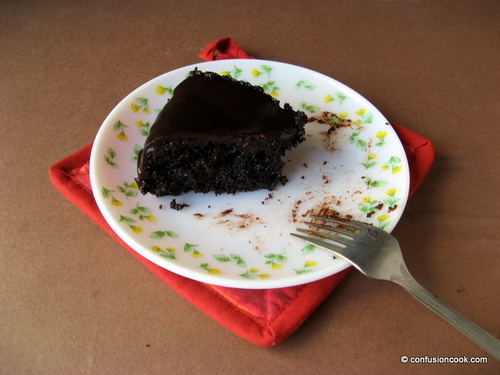 Eggless Chocolate Mocha Sachertorte | Happy Birthday dear son! In an episode, there was a blind tasting session, where contestants were asked to taste desserts & guess what they were. 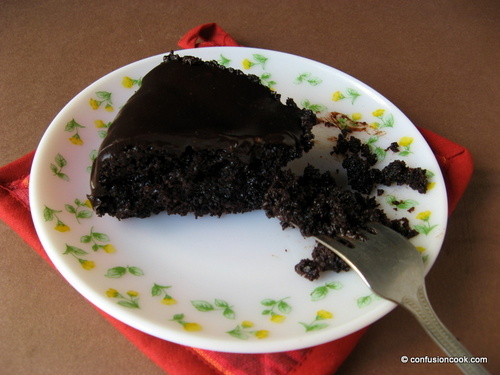 The person eliminated was not able to guess a chocolate cake – Sachertorte. This was the first time I had heard the name, I was quite intrigued to know what it was and why it would be difficult to guess. When the opportunity presented itself in the form of my son’s 4th birthday, I knew what I was going to make. A sachertorte is a chocolate cake filled with apricot jam/ preserve & served with a dollop of whipped cream. It is a Viennese Dessert. It is usually 2 layered cake. 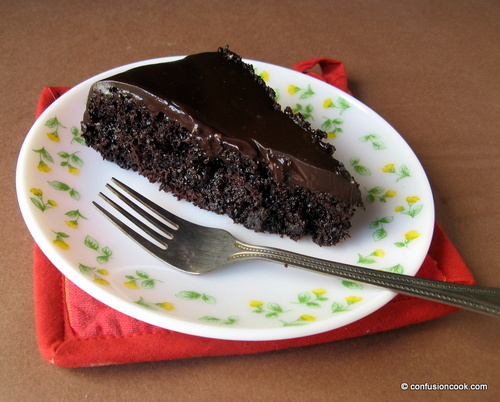 The chocolate cake is a sponge which is dense and not overly sweet. I used a mocha cake for the base as I’ve gathered in last few chocolate creations that coffee enhances the taste of chocolate cake. As I was using instant coffee powder, I added 1 cup milk to the batter to get get desired consistency. I reduced the quantity of sugar as we like our cake mildly sweet & I knew that my apricot preserve was quite sweet, so it would compensate. Usually the cake is not soaked in syrup & gives the taste of dry & moist in-between bites. So I decided to soak the cake in sugar syrup as kids would not enjoy such a cake. I used Apricot Glaze recipe from Kaffeehaus by Rick Rodgers. I used water in place of rum as I was making this for kids. The original cake is covered with chocolate glaze and has ‘sachertorte’ written with the same glaze and served. It is a very simple cake to look at. I tried to maintain the same simplicity. The cake rose beautifully and was deep & rich chocolate color. The kitchen was smelling wonderful – chocolatey & of baking! The taste was just out of this world. Ganache works beautifully always. :) Hubby placed a set of molded chocolates on top of it. It was a big hit with kids. Though in the party there was just no time to click a snap of a perfectly sliced cake so here I put together what best I managed in the commotion of 30 people – kids & adults in a small place. Pre-heat the oven to 180 C. Grease a 9″ springform pan. In a large bowl, whisk together flour, sugar, cocoa, instant coffee granules & baking soda. Add oil, vanilla, buttermilk & milk/ water. With a wooden spoon, stir until completely mixed. Pour the batter in the prepared pan. The batter will be liquid. Tap the pan against the kitchen counter to remove any air bubbles. Bake for 35 – 40 mins or till toothpick inserted near the center comes out clean. Remove the cake from oven. Allow to cool in the pan for 20 mins. Gently turn out on a wire rack. Bring the preserve & water to a boil in a small saucepan over medium heat, stirring often. Continue to stir & cook till the last drops that cling to the spoon are very sticky & reluctant to leave the spoon, about 2-3 minutes. Strain through a wire sieve, pressing hard on the solids. Use warm. Freeze the cake at least overnight wrapped in 2 layers of cling film. It allows slicing the layers much easier & neater. Slice the cake in 2 or 3 layers. Place the bottom cake layer on an 8″ round cardboard. Brush the top of the layer with apricot glaze. Place the second layer and repeat with juice & jam. Place the top layer on the cake. Brush the top & sides with remaining glaze. Allow to chill for around 30 minutes for the crumb coat to set in. Place the cake on wire rack & place a baking sheet lined with parchment sheet under the rack to catch any dripping chocolate. Make the chocolate ganache. It must be fresh & warm for even coating. Pour the warm ganache in the center of the cake. Working quickly, spread ganache with a large spatula or knife. 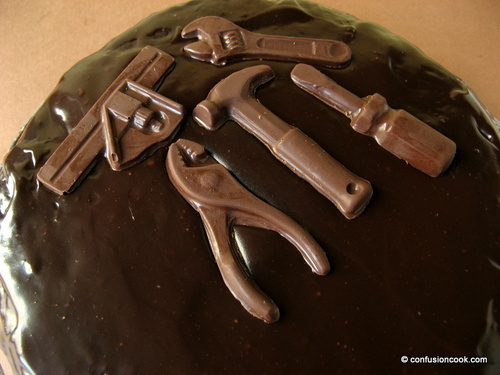 Use big strokes to push ganache over to the sides of the cake. If there is any un-covered spot, cover with ganache. Let the ganache set. Then chill for atleast an hour before serving. Serve chilled.